The development of self-operating machines is the foundation of modern manufacturing. This current manufacturing environment is based on automation and smart machines that have the ability to make things with a level of accuracy and consistency that humans cannot match. In order to maximize efficiency, engineers and managers need to change their outlooks, processes and strategies and as a result, adopt new methods and management systems. 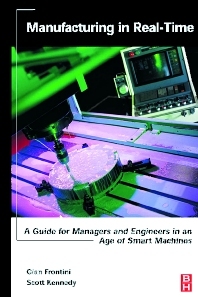 The authors demonstrate what is needed by first presenting a brief history of manufacturing and the changes we have already seen and then make their way into the current manufacturing environment. Topics covered include supply chain management, product streams, the role of automation in the supply chain, the relationships between machines and people in automated product streams (looking at what machines do best and what humans do best), variation and quality control, statistical process control, the flow of information in a supply chain and how all of these elements are effected by new technologies and need to be changed to allow for maximum efficiency as we move more toward automation in factories. Dr. Gian Frontini is a Senior Research Fellow at the Faculty of Applied Science, Queen’s University, Ontario. He teaches accredited academic courses and industrial training courses in manufacturing business strategy. He has held senior executive positions in the manufacturing industry, including Vice-President of Fabrication and Information Technology at Alcan, Inc. He is leading the research application of real-time information in advanced manufacturing systems at the Center for Automotive Materials and Manufacturing in Kingston, Ontario. Scott Kennedy is Principle Engineer, Technical Economic Analysis at the Ceter for Automotive Materials and Manufacturing (CAMM), and an adjunct lecturer at the Faculty of Applied Science of Queen’s University.